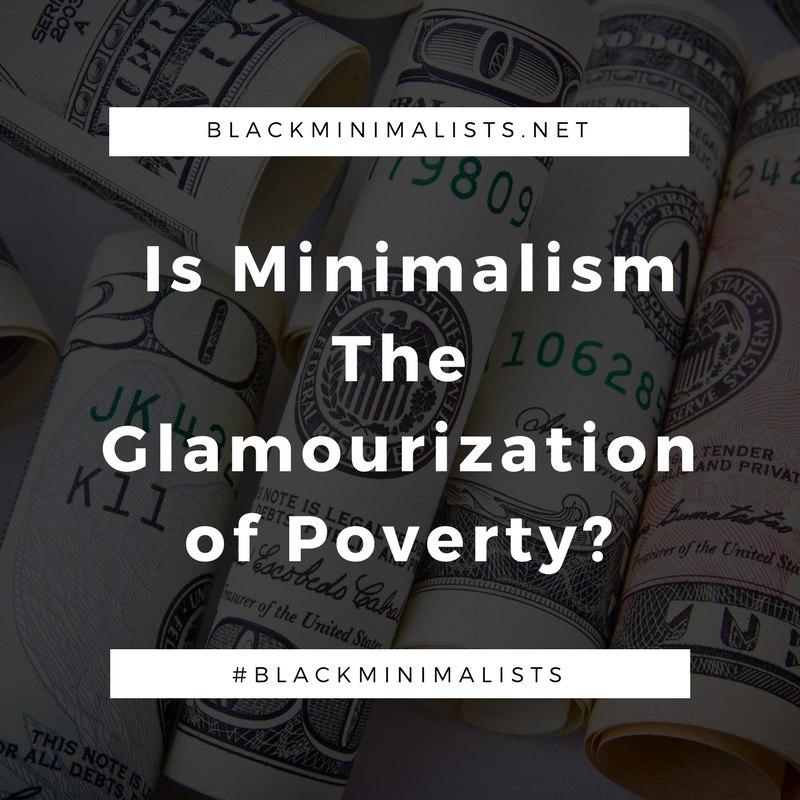 The Black Minimalists team answers the question we're often asked, "Is minimalism the glamourization of poverty"? Do I believe that minimalism glamourizes poverty? Not in the least. It’s true that often times people who live in poverty learn to live with less. This to me is one of the principles of minimalism. However, minimalism is also about learning to be free and unencumbered by unnecessary items. It doesn’t entail scarcity, it encourages you to surround yourself with only what brings you joy and what serves you. Adopting minimalist concepts is a privilege that most people living in poverty are not exposed to willingly; but out of necessity. I don't see minimalism as the glamourization of poverty. People who are poor or live in poverty are not poor by choice. Also, many of the life decisions people make while in poverty isn’t driven by choice or preference. Instead, it is driven by trying to meet a need while living in unfortunate circumstances. On the contrary, minimalism is driven by choice. It is about making a conscious decision not to consume or engage in certain activities based on a set of values. It is hard for many, not to view minimalism as a glamorization of poverty because it has become a new buzzword in mainstream society. But that's the problem with anything that becomes a buzzword in society. Capitalism forces people to seek ways to benefit off of it. We can see the same thing with self-care and we see the same thing with mindfulness. These are buzzwords people latch on to and they find a way to capitalize on it. This is a hard one for me. I see how minimalism has been co-opted for capitalist gain. You can now watch Tiny House Hunters or read an abundance of blog posts about how to create a capsule wardrobe. I see many minimalist tv shows and blog post devoid of meaning all in pursuit of making a profit. I think the issue is a lump sum game. People assume all minimalist have the same agenda. It is hard because my own minimalist journey and commitment to Black Minimalist are founded in this definitive choice to live with less. Whereas, poverty is about being devoid of options in a capitalist economy. My choice to live a minimalist lifestyle is about leveraging power, time and resources. We post articles about all aspects of minimalism but never in attempt to glorify poverty. As we work to uplift this platform and expand our services. Our hope is to educate, support and amplify black folks living intentionally. The minimalist lifestyle has never been about an aesthetics for me. But it is a commitment to live in a manner that honors my values and push against the system. In popular debates about whether the trend of minimalism is the glamorization of poverty, the word “choice” is often the defining word separating the minimalist haves from the impoverished have nots. Even my three team members above have referred to the word "choice" in their opinions. Personally, I find it a bit perplexing to say poor people lack choice and thus agency. Can you choose to be a minimalist and lack certain resources, i.e. be poor? From what I’ve read on the subject, it would seem not, but here I am, living proof. I grew up poor and by current U.S. societal standards, I’m still poor. I’ve lived in some type of low-income housing, including a trailer park, for most of my life and have received government assistance in various forms. I also have a college degree which ironically has both elevated and further impoverished me at the same damn time. I flirted with a middle class lifestyle while working my last full-time job five years ago. I chose to return to poverty and pursue a minimalist lifestyle after becoming disillusioned with the emotional, spiritual, and mental labor required to ascend to and maintain an average middle class life. Part of that labor also stemmed from an inability to reconcile a poverty mindset with a newly (physically) abundant one. Additionally, I know many people in the larger minimalist movement and within the black minimalist community who have chose minimalism as a way to skirt poverty or at least maintain what they have while living the most healthy, sustainable lifestyle they can manage. Choosing poverty is not glamorous at all, especially when you truly understand what it means to be poor. Would I rather not be poor? Absolutely, and I hope not to stay poor for much longer. What being poor (and minimalist) has taught me is to understand my values, who I am, and what I need and want at this point in my life. What gives me solace and empowers me in the midst of my poverty, is what I’ve found this time that has alluded me previously, freedom. The freedom to use my limited resources in ways that service my mental, spiritual, and physical well-being. The freedom to not let any label, be it poor or minimalist, define who I am, and to know I’m not defined by the stuff that I own. The freedom of knowing I’m living better, lessening my footprint in this world, and impacting my communities to do the same. This freedom comes from minimalism. Are there minimalists from privileged backgrounds who romanticize and commodify simple living? Of course, but why do people even care if someone wants to live a life they perceive as poor? At the end of the day, even performative poverty still consumes less resources and lowers negative environmental impacts, which still benefits everyone. When I hear people rejecting minimalism because of the perceived festishization of poverty, their arguments reek of smugness, but also some unacknowledged truths. I think the undercurrent of their disdain for minimalists comes from a belief in the American Dream where your value equals the amount of stuff you own and they don’t want to give up their stuff or they haven’t yet obtained all the stuff they think their entitled to per the dream. It’s a real fear to be considered “poor” let alone actually be poor, and they know their consumptive lifestyle is doing more harm to actual poor people than minimalism.